If you have chosen to copy a partition, you are said to be in "Partition Mode". You are going to copy a single partition from an existing hard drive. You will have control over some parameters of the operation. You may write the copy data to an existing partition (by overwriting it) or to unallocated space, provided that the target is large enough. If the selected target is not an unallocated space, disk image software Active@ Disk Image must have exclusive access to the target partition while writing the copy data. Before you confirm the details of the operation, disk image software Active@ Disk Image attempts to lock the target partition for exclusive access. Restart the computer — Choosing this option will lead to rebooting your machine, so please close all applications first before selecting it. As an alternative you might restart your computer the normal way. After you restart, start disk image software Active @ Disk Image and repeat the attempt to clone the partition. Although force volume dismount will work in most cases, it will not allow exclusive access when you are writing to a system partition or to a partition that contains a system memory page file. If you are dealing with either of these two cases, you may run Active@ Disk Image from a bootable CD or start your computer in such a way that the target partition is not part of the operating system. After you have selected a source disk to copy, you must select a destination disk. In the Selecting destination disk page, select a target disk to receive copied data from the selected disk. The disk that you select must be big enough to hold all the data in the source disk. If you select a disk that is too small, the Next button is disabled. After you have selected a source partition to copy, you must select a destination partition. 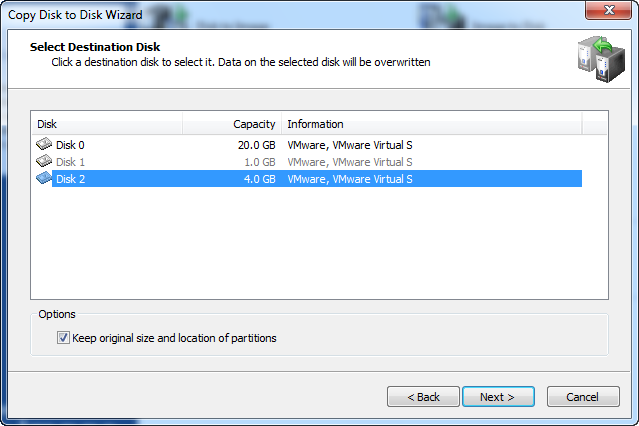 In the Selecting destination partition page, choose a target to write data from the source partition. You may copy the source partition either to an existing partition - where all data will be overwritten — or to unallocated space. Target partition size is not the only condition that must be met when you are copying to a partition. If the selected target is not an unallocated space, after you click Next, an attempt is made to lock the target partition for exclusive access. If the target partition is being used by another application or by the operating system, an error dialog box appears. Choose how the copy partition will be used in the system. The copy partition may be Active, Primary or Logical on a disk with Master Boot Record (MBR) layout. 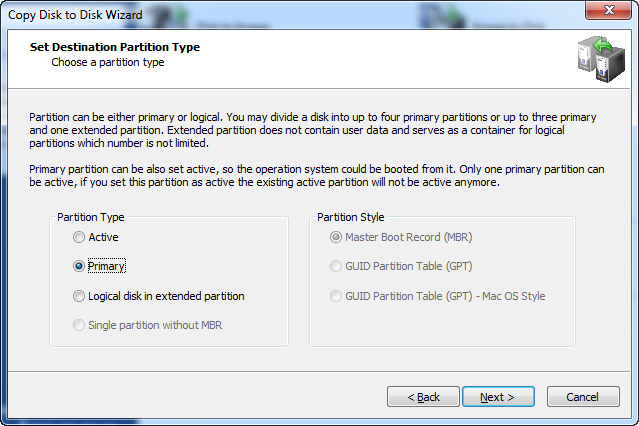 Only one partition on a disk can be set to active (the bootable partition). Choose Active type only when you are cloning a system partition and you want to boot from it. If you are cloning a system partition only to retrieve the data from it, choose Primary or Logical. GPT — is a standard implementation of GPT partition scheme. It used by both Windows and Mac OS with minor differences. However, when a Boot Camp is installed on Mac OS X computer, Mac OS uses different schema which is referred as Mac OS style. Basically it's a hybrid of MBR and GPT. Mac OS carries two structures simultaneously — it uses GPT for its own purposes and duplicates GPT records in MBR structure so it is understood by Windows. If you have a Mac disk partitioned with GPT which is dualbooted, use Mac OS style GPT for compatibility, otherwise use either MBR or GPT. If you are copying a partition to an already partitioned disk, partition style is locked and the choice of partition type is limited to suitable values. If you, however, restore image to a blank disk, you have a choice of partition style. Indicate the size of the copy partition. You may expand the partition in order to occupy more space than the original, or you may shrink the partition so that it uses less space on the copy partition. The two calculated values on this page show the minimum and maximum size that the new partition may occupy. The maximum size corresponds to the size of the partition or unallocated space you have chosen as the target. The minimum size is determined by the amount of space used in the disk image of the source partition. You may change not only the size but also the position of the new partition by providing values for Free space before and Free space after. The sum of all three fields must be equal to the maximum size of partition. When you change the value in one field, the wizard automatically recalculates the other values. If you enter an invalid value, all values are reset to the defaults. 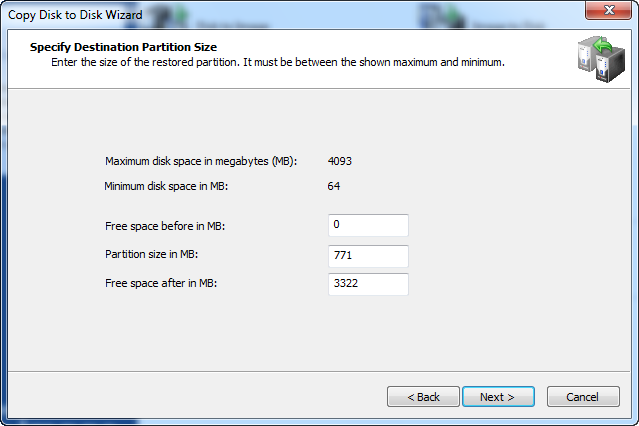 In a normal situation, you want the new partition to occupy the size of the target partition. If this is the case, do not change anything and click Next. 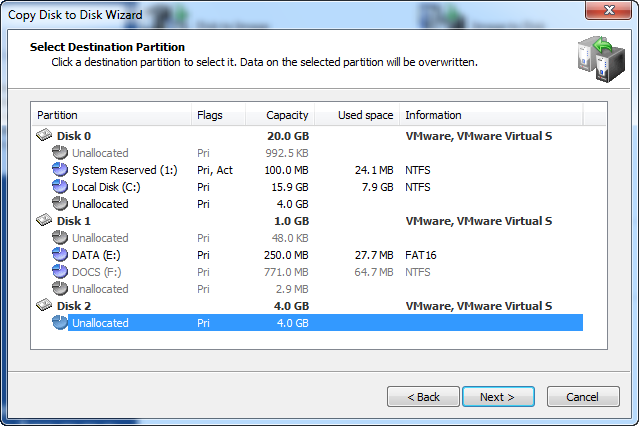 If you want to make the new partition smaller than the existing target partition, change only the Partition size value. Free space is added after the partition. You may enter only the approximate size of new partition. The actual number may be slightly larger or smaller due to disk geometry alignments. To use a letter that is already assigned, you must close Active@ Disk Image and free that letter. After the letter is free, start Active@ Disk Image again and return to this page. To allow the operating system to assign the drive letter, click No, don't assign drive letter. In this case Windows will assign a drive letter to the newly created partition by default, giving it the next free letter. 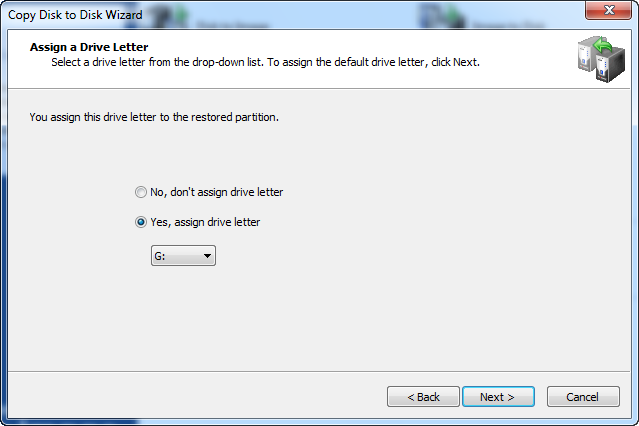 However, if no letter is given to partition you can use Disk Manager to assign a drive letter later. NOTE The drive letter you choose might be very important if the copy partition contains installed programs. For example, if your source partition is partition E:, you should write the copy to a partition with the letter E:. Otherwise, all links stored in the registry that refer to those programs installed on E: will become invalid. The process of copying a whole disk can take a long time. You can watch the progress bar on the Progress page. To stop the process at any time, click Cancel.